I'm not sure that this update should be titled 'BCR update' anymore. The main Birmingham Cycle Revolution schemes are now drawing to a close and although Birmingham has received more cycling money to build a cycle track from Bristol Road to Cannon Hill Park and there are routes planned as part of city centre regeneration schemes, there is not much more money available that we know of for cycle specific schemes. And that is a problem, because under current DfT rules, much more can be achieved with money specifically allocated towards cycling than can be money for, say, ‘smoothing’ the flow of (motor) traffic on main roads (see the Dudley Road update below for more on that!). The West Midlands Combined Authority board have allocated only £6 million from their £250 million Transforming Cities Fund - or 25p per head per year across the West Midlands. Added up with the other schemes currently in the pipeline, there might be perhaps £1 per head per year at most being spent across the West Midlands, not the £10 per head per year that the West Midlands Combined Authority set as a target in their Cycling Charter. Meanwhile, a new policy on valuing trees is causing us concerns about what effects it may have on the affordability of cycle infrastructure (see the section on trees below for more information about that). On Saturday 24th November, the Cyclenation and Cycling UK's joint campaigners' conference will be held at the Birmingham & Midland Institute. We will have sessions covering issues such as responding to planning applications (very important for dealing with poor schemes such as the Dudley Road plans), the role of direct action in cycle campaigning and the use of social media (both useful for building awareness when politicians aren't listening). We'll also be finding out more about Low Traffic Neighbourhoods, which I think are the missing link in the West Midlands Combined Authorities' congestion action plan, Sustrans will be there to talk about their review of the National Cycle Network, and Cycling UK will introduce their new national campaign for better funding for cycling. Tickets are only £10 (concessions available - contact us for the discount code). This update is a lengthy one. All of it is a riveting read (of course) but if you want to jump to the sections that interest you, click on these internal links: Main corridor routes; 20mph zones; signage for BCR routes; Green routes and canals; A457 Dudley Road update; Trees & highway schemes; Cycle hire; Cycle parking; Big Birmingham Bikes; Future city centre cycle routes. Both routes should be finished in early 2019. We asked about opening sections of the routes early, but because the final blue tarmac surface needs to be mixed in one large batch to save costs, it doesn’t seem that opening sections early will be possible. There are some raised ironworks in the track that would create hazards for people cycling along the routes, and not all of the traffic signals will be fully functional. However, some sections have already had people ignoring the signs and riding along them. It appears that there isn’t much that the BCR team can do to discourage that apart from putting up signs to tell people to stop. Now that many sections of the routes have been substantially completed, the width of the cycle track can be better appreciated. The 3 meter width that the tracks have along most of their length feels very wide and will accommodate many more cycle users than the canal towpaths and green routes which are often 2 meters at best. It is worth visiting the tracks to have a look and see just how wide the cycle track feels. The section being built along Bristol Road from the Priory Road junction is a good section to see this - although there are several points where it narrows to just over 2 meters to accommodate a tree. At the two Middleway junctions, with Bristol Road and Newtown Row, the new junction design has delivered substantial space for people walking. The new space for walking at the Bristol Road junction is particularly impressive, with more width than the cycle track (see photos below). Those sections of the route should be open soon, and at the Bristol Road junction because the crossings are toucan crossings, we will soon be able to start cycling across the new junction design. The final 20mph area under the current BCR funding has been finally put into force, with the sealing of the Traffic Regulation Order on the 9th November. A report on the impact of the initial areas is being complied, and initial results show a decrease in collisions in the areas covered by 20mph limits. There will be another follow up report in a couple of years time. We were told that Birmingham City Council has a policy to implement 20mph across the whole city, which would cost about £10 million for the repeater signs needed. It would be much cheaper if central government were to make the default speed in urban areas 20mph, so that repeater signs were only needed on roads that deviated from 20mph, rather than on roads that deviated from 30mph. Plans have been drawn up to put up signs on the BCR routes to help people understand where the routes can take them. And there will also be signposts on nearby roads, alerting people to the existence of a nearby green route and where it goes to. This is something that Worcester has done, and it provides a daily visual reminder of the existence of the cycle routes and where they go. Without good signage, cycle routes will not be used as much as they could - for example the A37 Parkway route from Castle Vale to the city centre is safe and comfortable, but there are no visual clues to indicate that it is a cycle route for much of its length, so it is hardly used. A good signposting strategy would help with that. Most of the green routes have been completed, with just the Solihull sections of the Castle Bromwich Hall & Gardens and Lyndon Playing Fields / Yardley Cemetery schemes waiting to be completed in early 2019. The new bridge for Bourn Brook near to Woodgate Valley Park is being fabricated off-site, and will be installed once legal transfer of surrounding land has been completed. Work is continuing on canal access points across Birmingham, with schemes at Lincoln Road, Yardley, Pershore Road, Kings Norton and Edgbaston Tunnel completed. The legal agreements for transferring land at Brookvale Road, Witton will hopefully be completed soon, and then work will start there and at Perry Barr. The plans for Northbrook Street and Bristol Road, Selly Oak seem in perpetual development, but we have been told progress is being made in looking at options and reaching agreement with adjacent land owners. The engineers working on the Dudley Road project came and discussed with us the plans that had been put forward for consultation (You might like to read our criticisms before carrying on with this section). The discussion focused on the use of shared use paths as opposed to cycle tracks, what happens when cycle tracks cross over side roads, and the general focus of the scheme. The scheme is funded predominately from the DfT as a highways improvement scheme. This means that the engineers have to used DfT approved measures of ‘traffic flow’ and show through their computer modelling that the scheme will result in improved traffic flow. There has been much criticism of the numbers that the DfT uses for judging the value of particular modes of transport in traffic flow modelling - people on cycles or walking count less than people in private cars. Because of the focus of the money for this scheme and the DfT calculations favouring motor traffic, then the scheme has to widen carriageways and provide more space for motor traffic, or it won’t receive the funding promised by the DfT. We made clear that there are growing numbers of people in Birmingham who are unhappy with the status quo and will object to schemes like this, regardless of the conditions that the DfT has put on the access to that money. We will also continue to object to schemes that we think are too compromised, such as this one. The cycle track and shared use pavements had been put into the scheme as additional to the main focus, and for this, we ought to note that this is a higher level of ambition for the inclusion of cycling infrastructure in a non-cycling scheme than would have been the case 10 years ago. But even so, there ought to be a minimum level of design standard that should be met. The decision to include extensive shared use pavements rather than separate cycle track and pavement was partly due to money but mainly due to concerns about having sections of cycle track that are too discontinuous. The cycle track from the bottom of the hill next to Tesco continues up to just before the canal, where the road crosses a bridge that is relatively narrow. At that point, the plans have shared use pavements for the rest of the distance, across the front of the hospital site and over the next canal bridge. We were told that they didn’t think it would be a good thing to have a short section of cycle track between the two bridges, as it would look too disjointed. This is not the first time we have heard this argument. When we recommended that the Bath Row bus gate be built with cycle track integrated into it, the planners said that it would look bad having such short sections of cycle track not connected to anything. And we have found out that sections of cycle track in highways plans that went out to consultation in 2015 and which have been built now, were removed because it would look odd having such short sections of track. The problem is that the cycle tracks have to start somewhere - if Birmingham never builds a short piece of cycle track, then every new scheme will have no cycle track to connect to, and so those too will never have any cycle track included. 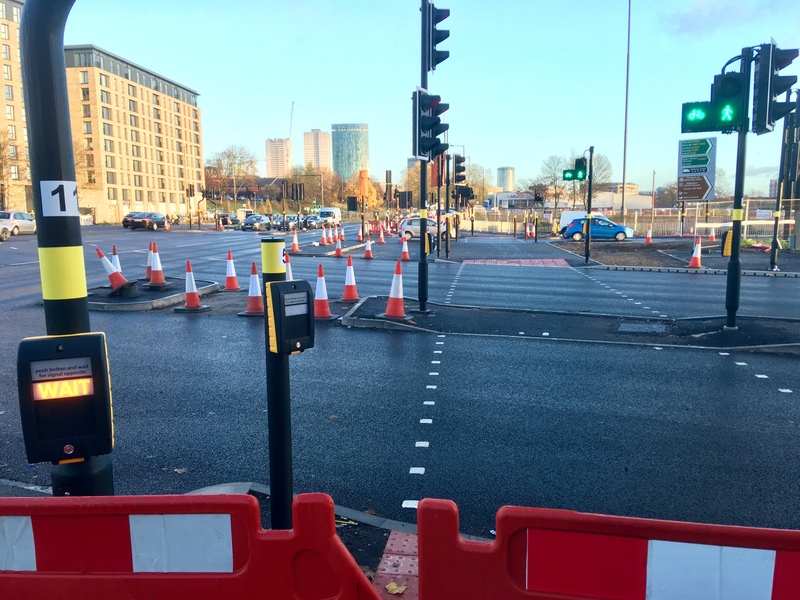 If Birmingham City Council doesn’t tell its engineers to include cycle tracks whenever possible, regardless of length & disconnection, then we will continue to put in infrastructure that discourages cycling. This is a political decision, and one that we will be lobbying for. We made it clear that we wanted to have as much cycle track along the route as possible, even if it was disconnected in places. We also explained that we thought it was better to continue a cycle track over a junction, rather than end it just before and make people on bikes share space with people who are walking. It is better for people walking and cycling to have their own space on a junction so they don’t have to worry about each other at the same time as looking for cars. The other issue was that the scheme had the cycle track stopping at each side road. In the discussion, we were told that there was a safety fear about the use of continuous cycle tracks across road mouths because of the likelihood of someone driving a car around the corner without looking for cycles. We explained that discontinuous cycle tracks with breaks at each road mouth discourage people from cycling on them, so you end up with two-tier infrastructure where people cycling on the road get abuse from people driving cars because they ‘should be on the cycle track’. Sustrans had suggested in their response (and I’m embarrassed that I missed this in our response) that the road mouths be made one-way, so that people could exit but not enter, and this would change the risk for continuous cycle tracks - this is a very good suggestion and one that we will continue to push for. While changing the road mouths to limit motor traffic flows does inconvenience local residents, it also makes the walking and cycling environment around them more pleasant. Simple changes to street layout like this are key to Low Traffic Neighbourhoods, which are important for achieving a shift away from the car for short trips. In summary, there are several points arising from this scheme that we will need to get Birmingham City Council’s councillors to agree to: Firstly, that where DfT measures for ‘smoothing traffic flow’ do not award the construction of cycle tracks, BCC will need to agree to find more money to be able to pay for the high-quality cycle infrastructure that we urgently need; Secondly, that sections of high quality cycle infrastructure should be squeezed in whenever possible and even where there is not currently other infrastructure for it to be attached to, so that future schemes do have infrastructure to connect with; Finally, that a clear decision is made to build continuous walking and cycling infrastructure across the mouths of side roads in the understanding that we are working towards changing our attitudes when we are behind the wheel of a car. Many cycle infrastructure projects on main roads involve the removal of trees, as cycle tracks are often constructed between pavements and the general highway, where trees have been planted. Trees are popular (except with some of the people who own houses next to large trees) and when highways schemes involve the removal of trees, there are many objections. To solve this, the policy of replacing each tree that had been removed with two new trees was introduced. Those extra trees need to be planted relatively close to the scheme, although I have been told that it can be difficult to find places that do want the new trees (see my comment above - Hint: if you want a new tree or two, find a highways scheme near you and offer to let them plant some of the replacement trees in your garden). However, a policy of replacing a large mature tree with two small saplings that might get vandalised and which will take 20 years before they provide the same benefits has had its criticisms. So Birmingham City Council has developed a new policy, where trees that will be removed are evaluated and assigned a monetary value. So larger, mature trees, which are more difficult to replace, are assigned a higher value while a small young sapling would be given a lower value. The value of the trees being removed is added up, which then is included in the cost of the highways scheme. That money is allocated to a ‘Birmingham Tree Bank’, which would fund new trees and green infrastructure, and also provide revenue funds for their upkeep. This is a good policy, as it gives a flexibility for Birmingham City Council to spend the funds where they are most needed, rather than plant 2 new saplings in perhaps substandard locations. We are concerned, though, that this new policy will impact heavily on cycle infrastructure schemes because of where cycle tracks are being located. A highway scheme that only changes the existing highway won’t affect trees because there aren’t any trees planted in the middle of road where cars are driven. But when a scheme affects the kerb line of a road, or involves expanding the space that the pavement / cycle track has, then trees often need to be cut down. If a mature tree is assigned a value of £100,000, it only takes 10 trees to add £1,000,000 to the cost of a cycle track. For example, both the A34 and A38 cycle tracks currently being built involve the removal of about 17 trees each, which could add a cost of up to £1.7 million to each scheme, more than 10% of the cost of each scheme. With money for cycling projects being scarce, adding this sort of cost onto a cycle infrastructure project could substantially restrict what can be achieved. We will be digging deeper to find out more about how this new policy will work and what the impact will be on cycling schemes. We previously reported that work was being done to connect Transport for West Midlands Swiftcard payment system to the Nextbike UK payment system, and that this was something that was holding up the rollout of the cycle hire scheme. We’ve been told that TfWM and Nextbike are working through every step of the system to make sure that the experience for people hiring bikes is as smooth as possible from the very first day. This checking process takes time, and so the goal is now to roll out the bike docks early in 2019. This is perhaps not such a long delay as it looks, as in summer this year, only the docking locations at University of Birmingham’s campus had been identified. Work on identifying suitable locations is proceeding, so that when the scheme is launched, there should be minimal delay in installing the docks. Since September, about 450 cycle parking spaces have been installed across the city centre. A further 41 locations will have parking installed in spring 2019, and there is a small amount of funding leftover from the BCR programme for a further phase of cycle parking. Opportunities for those locations are being explored at the moment. All of the 2,000 bikes being distributed in the second phase should have been handed out by Christmas this year. The cycling activities that have gone alongside the BBB programme are now part of the Active Wellbeing Service, which has an independent body from Birmingham City Council. We have been shown draft proposals for a cycle route connecting up the A38 and A34 cycle tracks, and for the new layout of Digbeth High Street. Firstly, for the connection between the A38 and A34, the route will use Moor Street Queensway, utilising highway space taken away from motor traffic. There are proposals to restrict Moor Street Queensway to public transport and taxis, which will mean that much of the existing highway space could be reallocated. The proposals include a cycle track from the end of the A34 route opposite Aston University, continuing down the side of James Watt Queensway, and on to Moor Street Queensway. Part way along, it would cross over to the side with Moor Street Station and the new Curzon Street Station, which is important because having a segregated cycle track running right past the station entrance will help people to access the station much more easily. The route would then probably run through Swan Passage onto Smallbrook Queensway, to connect with the A38 route at Hurst Street. In the long run, there will be a cycle track continuing down the side of Selfridges, to connect with Digbeth High Street and the new markets development, but due to the redevelopment of the markets, it will be perhaps 5 or 10 years before a cycle route could be taken through there with any certainty that it wouldn’t be blocked off at various intervals. We have suggested that the Smallbrook Queensway option is a better long term solution because it brings the cycle track past the entrance to New Street Station, and the gradient is shallower than the gradient up the side of Selfridges. With the blocking of the through route for private motor traffic at Swan Passage, Smallbrook Queensway is much quieter and has ample space that could be given over to dedicated cycle lanes. Secondly, for Digbeth High Street, the current proposals are to push private motor traffic onto Bradford Street, and create a public transport corridor along Digbeth High Street. There will be segregated space for the tram tracks, then space for buses and taxis. Sprint buses will have their stops in the main carriageway, while regular buses will have lay-bys to get them out of the way of the Sprint buses. Cutting across the High Street will be a couple of access routes for deliveries and private motor traffic, but bus gates will stop anyone driving the length of the High Street. For cycle users, the current main focus for routes is on facilitating access across Digbeth High Street, such as from Rea Street (next to the coach station) across to Milk Street. We have suggested that using filtered permeability (cutting through routes for motor traffic) around Bordesley Street would help to make that area much friendlier for cycling. For Digbeth High Street itself, a segregated cycle track has been explored, but it has also been suggested that a bi-directional cycle track be provided on Bradford Street, and cycle users travelling along the High Street just mix with the buses and taxis. The criticism we have of this is that as Digbeth regenerates and the High Street becomes a better place for people, then the number of destinations there will grow and so the number of people who want to cycle along the High Street will grow. We should not be designing major renovations of roads that put 12 year old children, say, in the same space as multiple Sprint buses, regular buses and taxis. Having a segregated, clear and well defined, cycle track will improve comfort for everyone: for bus drivers who will have fewer interactions with cycles to focus on, to people on bikes who will have fewer interactions with buses to worry about and people walking who will be better able to predict where bikes will be going. Of course, it may be difficult to fit in tram tracks, bus lay-bys, highway lanes, wide pavements and a cycle track. But perhaps in that case it would be better to build in a slight hold up for Sprint buses by removing the bus lay-bys, rather than discouraging cycling and holding up Sprint buses even further by mixing people cycling with them. The traffic models that are being used show that Sprint buses will be delayed if other buses don’t have lay-bys, but we are sure that those models have not considered what the impact on times for Sprint buses would be if the modal share for cycling in Birmingham was 10% and the Sprint buses were held up behind all those bikes. Segregating cycles from Sprint is more important than a couple of lay-bys for regular buses. The new crossings at the junction of Bristol Road and the Middleway. The toucan crossing as broad and direct, with wide direct cycle crossings next to them - a substantial improvement in the walking and cycling environment in this area.